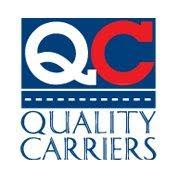 Quality Carriers and our affiliates are seeking MILITARY-VETERANS and professional truck drivers. We are looking for Company Drivers. You've served the nation and can continue to serve in a role which is critical to our customers and the nation. Delivery of their products allows the country to grow and thrive. You can be a part of this by joining our team. Benefits Flexible Home Time Paid Holidays / Paid Vacation Dedicated Lanes Regional work Great Pay $$$$ Paid Weekly & Direct Deposit Available Paid orientation/training Plenty of ways to earn Extra $$$$$$ Sign on Bonus $1,000 Referral bonuses of $1,500 Steady year round work Medical, Dental, Vision Benefits / Premium 401(k) plan Requirements Must Have CDL-A with Tanker and Hazmat endorsements TWIC card (Must have or be willing to obtain it) Must have 1 year Tractor Trailer experience in the last 3 years Questions call 888-690-9507 Quality Carriers will consider your Military experience: Apply Here ... for immediate consideration https://intelliapp2.driverapponline.com/c/qualitycarriers?r=driverspost As you can see we have many positions available posted on this site, with over 120 terminals we may have something in your area. If you are interested in one of them you need to apply by filling out the application. It is the only way we will know that you are interested and want us to contact you. We see a lot of views on the postings and some apply clicks but do not receive anything telling us you are interested in one of our positions. This link supplied takes you right to our application. We will contact you within minutes of receiving it and review the application with you and discuss the opportunities of the position that interest you. Thank you and have a great day.